This post is part of the Dynamic Duos in Classic Film blogathon hosted by fellow classic movie bloggers Once Upon a Screen and Classic Movie Hub. Irene Dunne and Cary Grant starred in three films together during Hollywood’s Golden Age. One of those films is an undisputed classic and the others are still highly regarded by students of film. Not only were the pairings of Dunne and Grant popular with the critics, but with the public as well. All of the films they starred in were box office smashes, showcasing the stars’ unique talents. And these delightful pairings almost didn’t happen. Irene Dune established herself as the star of successful melodrama’s like Back Street (1932), The Silver Cord (1933), This Man Is Mine (1934), and Magnificent Obsession (1935). A trained opera singer and stage actress, Dunne also triumphed as Magnolia in Show Boat (1936). When offered the lead role in the screwball comedy Theodora Goes Wild (1936), she resisted. Having carved out a nice career for herself as a dramatic actress, Dunne didn’t want to ruin a good thing. So reluctant to star as Theodora Lynn, Dunne supposedly extended her European vacation, hoping the producers would give the part to another actress. But the suits at Columbia were set on Dunne and they persisted—some say to the point of threatening a lawsuit since Dunne had signed a multiple picture deal with the studio. by starring in popular melodramas. Theodora Goes Wild was a showcase for Dunne’s incredible versatility. She sings, she dances, she plays the piano, (Dunne received a degree in music from Chicago Musical College, now Roosevelt University) and she shows her seemingly effortless comic timing. Dunne was so good as Theodora Lynn that she received the second of her five Best Actress Academy Award nominations. The comedy landscape would never be the same. In the wake of that comedy triumph, it was inevitable that the studio suits would put Dunne in another comedy. The Awful Truth (1937) is a screwball comedy masterpiece that put Cary Grant on the map. Before this film, Grant was doing fine as eye candy to his more famous female costars. As popular as he was, he hadn’t yet solidified his movie image and on-screen persona. Like Dunne in Theodora Goes Wild, Grant was reluctant to make The Awful Truth. Grant originally didn’t feel comfortable under Leo McCarey’s direction. McCarey had an improvisational style that was troubling to the actor. As crazy as it seems today, Grant campaigned to switch roles with character actor Ralph Bellamy. Ironically, it’s McCarey’s direction and encouragement that helped established Grant as one of the best light comedy actors of all time—according to director Peter Bogdonovitch, “there was Cary Grant and everyone else was an also-ran.” In The Awful Truth, Grant is charming, funny, and showed that he was a master at physical comedy. Paired with Dunne, he appears comfortable, assured. He also looks as though he’s having the time of his life on screen. The chemistry between the two stars was magical. The film made Grant a superstar and Dunne earned another Best Actress nomination. Do you remember “The Awful Truth”. . . Do you remember Mr. Grant and Miss Dunne as the interlocutorially divided lovers, whose immediate return to domesticity was prevented by nothing much more substantial than Miss Dunne’s tantalizing contrariness? Then you know pretty well what to expect in “My Favorite Wife” only more of it. Once again, Dunne and Grant starred in a critically acclaimed picture. Once again they starred in a box office smash. 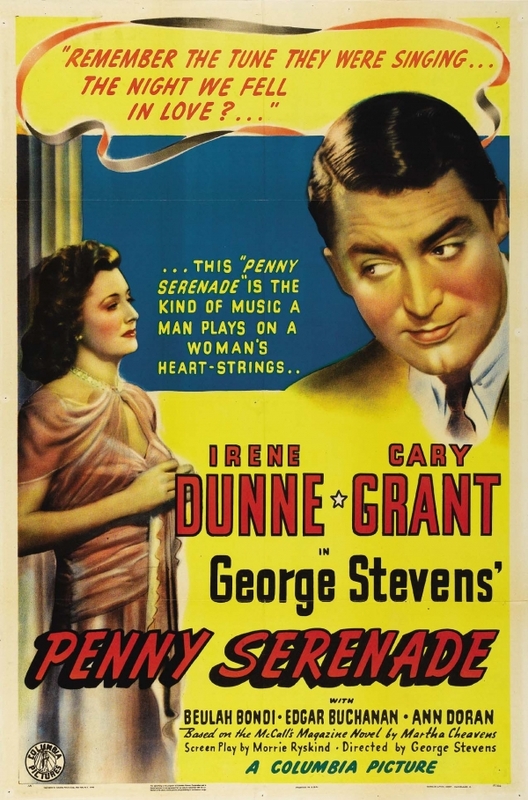 Dunne and Grant would take an interesting turn with their next pairing, Penny Serenade (1941). The stars play a young couple who adopt a child and then struggle to raise her under economic hardship. When their little girl suddenly dies, their marriage is put to the test. Directed by George Stevens with a sure touch, the movie tugs at your heart without devolving into crass sentimentality. Our friend Crowther noted the movie’s successful manipulation of his emotions, but praised the picture overall, saying this about the two stars’ performances, “…some very credible acting on the part of Mr. Grant and Miss Dunne is responsible in the main for the infectious quality of the film.” Both performances by the two leads are heartbreaking. Grant has a remarkable scene where he pleads with an adoption agency worker that will break your heart—if you don’t find yourself moist around the eyes, you’re not human. For this performance, Grant received the first of his two Best Actor Academy Award nominations. Of all the famous screen teams, I think Dunne and Grant are often overlooked. 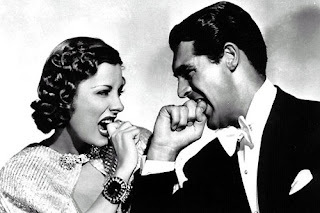 The world would be a much sadder place had the movie paths of Irene Dunne and Cary Grant never crossed. For more great posts on Dynamic Duos in Classic Film, be sure to click on the links at the top of this page. I have a special place in my heart for Penny Serenade as well - it was the first movie I ever watched in my life and in this country when I was five. SO happy you MADE IT to get this in for our event! Thanks, Aurora. Would have liked to have been a little more thorough, but it was more important to me to keep a promise. I absolutely love these two together and agree that Dunne was Grant's best costar and vice versa. They had a comfort, ease, and rhythm on screen that Grant never attained with Hepburn or anyone else,in my opinion. Thanks for inviting me to participate. It always blows me away when I hear Irene Dunne wasn't keen to do comedy. She is SO GOOD at it! I'm glad you covered Dunne & Grant for the blogathon. They really make magic on screen, don't they? I know. Dunne said comedy came easily to her, so perhaps she didn't appreciate it as much as her dramatic roles. Every time I watch "Theodora Goes Wild," I'm amazed by her comic timing and physical presence on screen. She was made for comedy! Very nice Stephen 😊... I was lucky enough to had seen Casablanca in Bryant Park in NYC! totally a classic & yes, they breezed through film so natural.